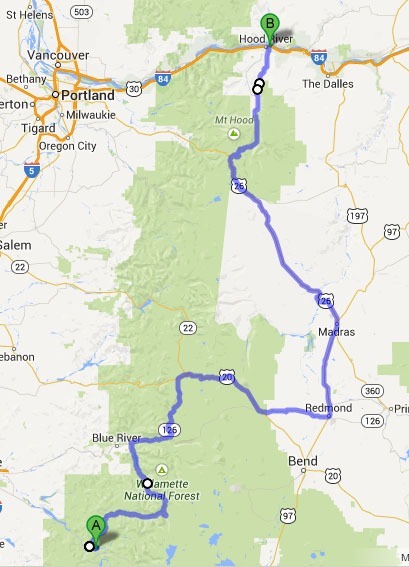 In this section we travel through the center of the Oregon Cascades, through thick forests and lush greenery on some great little roads. Forest road 19s section descending to meet state highway 20 being some of the best road I have ever ridden. A destination road if their ever was one. Forest road 42, sometimes called the Oregon skyline road is closed sometimes well into June but is a wonderful road that you just meander along. A one lane affair where the forest service has built turn out ever half a mile or so. something I never see in California. You pass to the west of the Three sisters and see Mt. Hoot looming in the distance, passing just to the east of one that most beautiful of all the mountains along the entire route.